In my previous post, I mentioned how miserable I was but didn’t get a chance to explain. Well here it goes. A few months ago, I order tickets for the V8 Supercars race here as an early Christmas gift for my hubby who is a major Holden fanatic. How was I to know that I would have the flu on the weekend of the race?? On Thursday night, I mentioned that I was feeling a bit odd but MJ took no notice. On Friday morning, right before we are to head out to the race to see the cars practice I tell MJ that I feel like crap…sore throat, ear ache, shivering, and so forth. MJ says that I’m just trying to get out of going to see the race. So despite the fact I’m feeling like crap, I go with MJ and bring LJ along to see the practice laps. Not only am I not feeling well, it’s raining, cold and windy, plus I have to make sure that my toddler doesn’t become deaf in the process of watching the cars go round and round. LJ loved the cars…not at first. When he first heard the roar of the cars, he couldn’t climb up on top of me fast enough and dig his head in my neck. Once I covered his ears as best as I could, he started to enjoy himself. Luckily we stayed only for about 1.5 hours on Friday. Unfortunately, on Saturday and Sunday it was an all day event. On Saturday, it was cold, wet and windy and I’m feeling worse but at least I didn’t have a small child to take care of so I started to get into the whole race (after I got myself some earplugs). (Sidenote: I can’t believe how many small children were there without earplugs or something to cover their ears. Now I understand why there are so many hearing clinics in this area.) Once home, I realized we had windburn on our faces and it wasn’t very pretty. And MJ was on TV but we didn’t get to see him! Everyone has since told him that they saw him on TV! On Sunday, I’m weak and tired and royally sick and I had thrown up the night before but I’m determined to see the end of this. The weather is better. A bit chilly but the suns out. Little did I know that the Australian side of the sun is a killer but I get ahead of myself. Even though Holden is losing big time and Ford is doing well, MJ is having a good time so I have to have a good time. We had pit passes so we went and saw Mark Skaife’s car getting a new engine fitted AND we saw Mark Skaife in the flesh. (Didn’t realize he’s a cutie until I saw him!) MJ got his new HRT cap autographed by the legend and he was on Cloud 9. Garth Tander passed right in front of us but I had no idea who he was until MJ pointed him out. Then we saw the end of the race. Once home, I realized how red my face was with not only windburn but sunburn plus I still feel like crap. On Monday, I’m so beyond sick and my face and head are killing me from the sunburn. Then I have to deal with a million other things as well that adds stress to the horrible way I’m feeling but that’s another post. All in all the V8 Supercars weren’t that bad. I had visions of rednecks scratching their balls while guzzling down beer after beer. I was right – but not everyone that went to see the race were rednecks. I told MJ that I would have enjoyed myself if I wasn’t sick and if we were better prepared to deal with the unpredictable Australian Spring elements. I probably won’t volunteer to go to the next race anytime soon but I did promise MJ we will go again…unless I’m sick and he’s on his own. 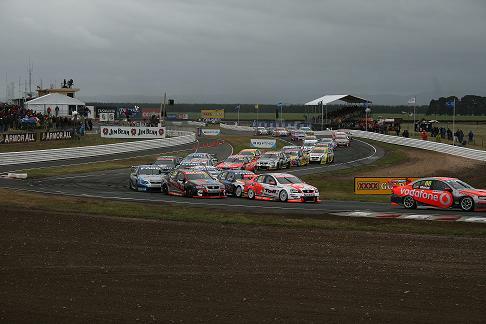 Share the post "V8 Supercars weekend"